Is ratatouille one of my all-time favorite meals ever? I mean, maybe. This is only the third time we’ve made a variation of the dish for the blog, so I can’t imagine why anyone would think I’m in love with it. The first ratatouille recipe could feed a crowd and the second ratatouille recipe is single-serving magic. The reason I love ratatouille so much, I think, is because of its brilliant simplicity. In all honesty, the dish is just a mashup of the simplest summer ingredients. It doesn’t seem like anything special at first. But after everything is cooked together, the flavors become something completely different – layered and complex, savory and aromatic. All because a few key ingredients were combined. I swear it’s some kind of French magic trick. This recipe is a kebab version of a familiar classic. It layers all of those ratatouille ingredients so they can be grilled together to tender perfection. After the kebabs are grilled, the rest is up to you. Personally, I’m a big fan of pouring spicy pasta sauce over top of the kebabs and devouring with a fork. I’ve also been known to sprinkle on goat cheese while they’re still hot and then pour pasta sauce over top. Either way… I guarantee that it’s a mouth party. And this recipe is so easy, that even someone who’s never grilled before can make it! First off, fire up the grill so it’s ready when you are! Slice the zucchini and the yellow squash into thin rounds – about 1/3″ in thickness. Slice the eggplant a little thinner since it takes longer to cook. De-stem the mushrooms. 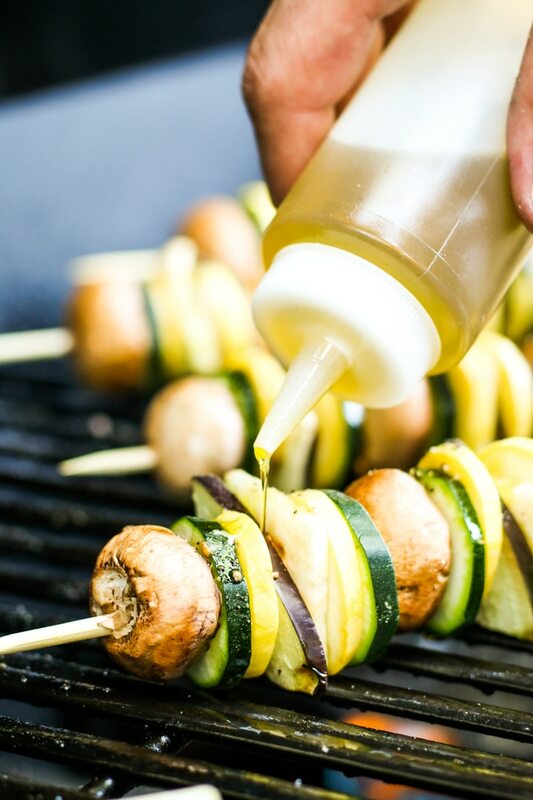 Soak your bamboo skewers in water for a few minutes to keep them from burning, then layer your veggies all nice and pretty on the skewers. Arrange the skewers on the grill and brush with oil. Season to taste with salt, pepper, and red pepper flakes. Then grill for 20 minutes, rotating every 5 minutes to get nice color on all sides of the kebabs. Serve up that summertime goodness and enjoy! See, everyone can be a grill-master! Basically, this recipe makes it possible to enjoy ratatouille on a stick for maximum summer vibes. Just imagine – you’re chilling outside with a glass of rosé, listening to some Bob Marley tunes, and then bam! – you’re enjoying a delicious medley of summer’s finest veggies in portable, grilled form. You can thank me later. 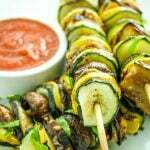  Or better yet – just Instagram your ratatouille kebabs so I can show off your mad grilling skills. 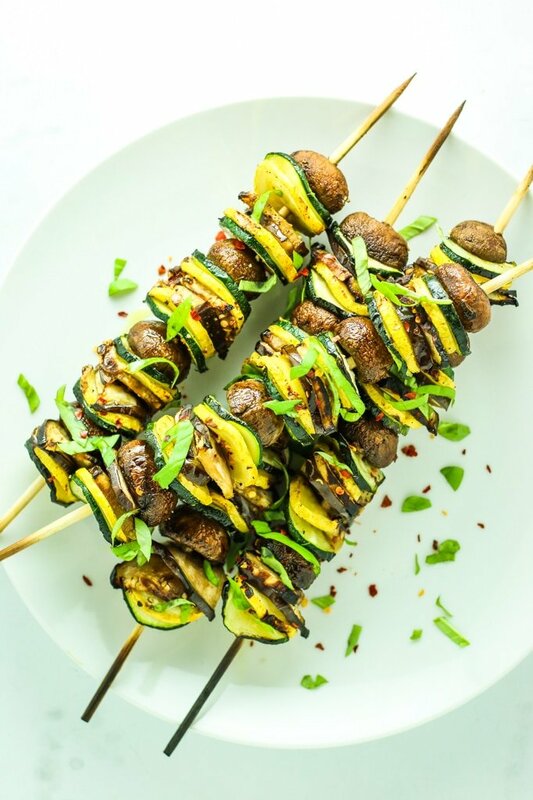 This grilled ratatouille kebab recipe is a skewered version of a classic French recipe using summer zucchini, squash, and eggplant. If you’re using bamboo skewers, get them soaking in water for 3-5 minutes. This helps prevent burning and breaking. Chop ends off zucchini, yellow squash, and eggplant. 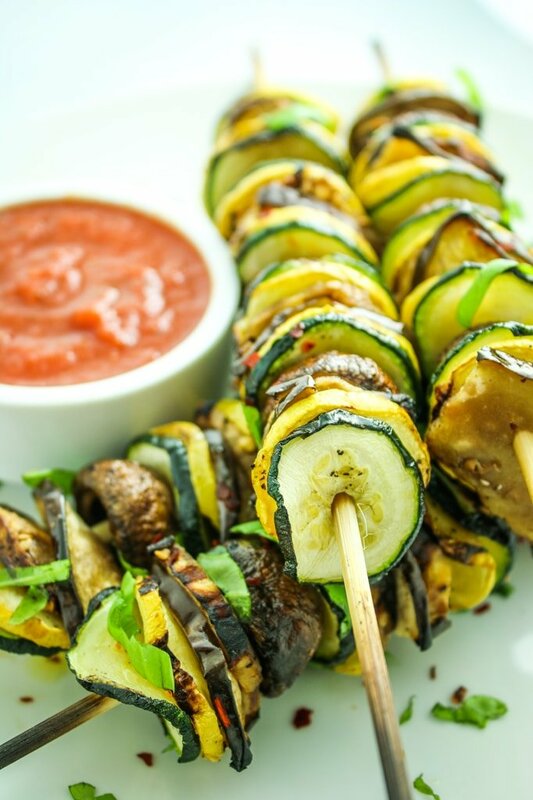 Slice zucchini and yellow squash into thin rounds – about 1/2″ thick. Slice eggplant slightly thinner, if possible – since it tastes the longest to cook. We sliced our eggplant in rounds, then cut the rounds into four quarters to make them close in size to zucchini and squash. 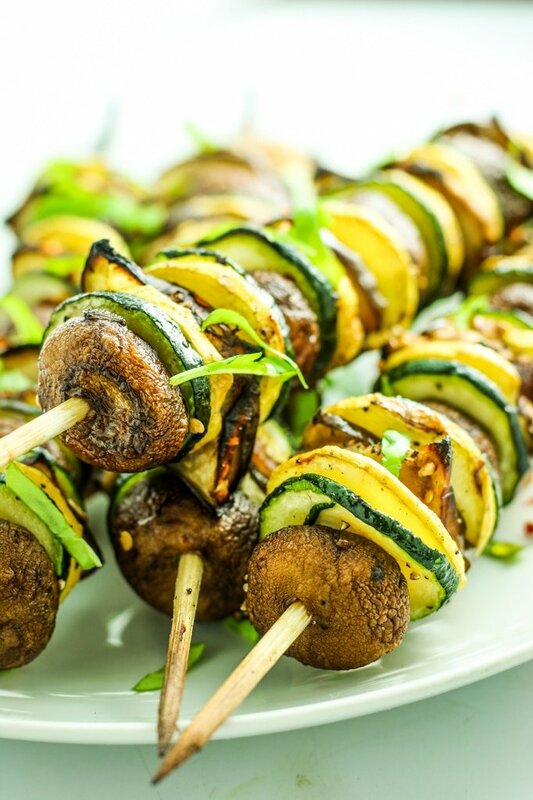 Assemble your kebabs, layering zucchini, yellow squash, eggplant, and mushrooms however you like. Preheat the grill to medium-high. Place kebabs on the grate and spray or brush generously with your favorite cooking oil. We like to use avocado oil for high heat cooking. Sprinkle with salt, pepper, and red pepper flakes if desired. Rotate every 5-ish minutes and spray lightly with oil each time. Kebabs should be tender and cooked at about 20 minutes. Remove from heat. Sprinkle with fresh basil and or chevré goat cheese. 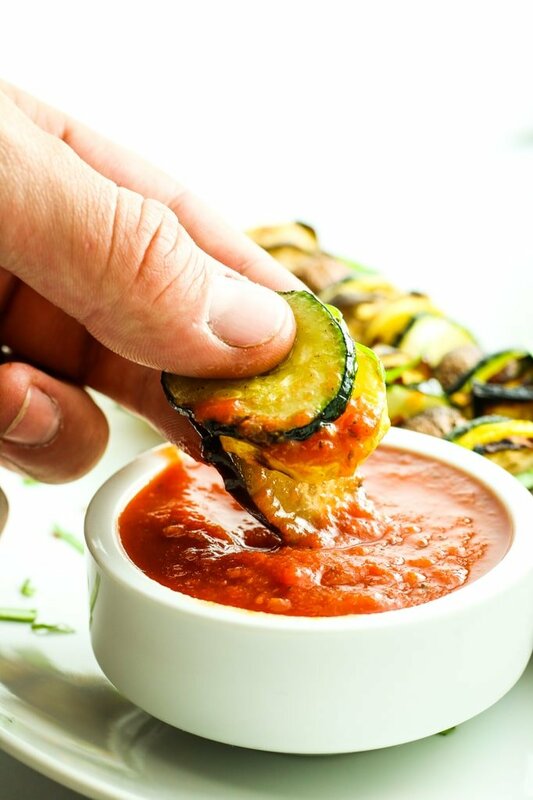 Dip in your favorite pasta sauce. Douse with your favorite pasta sauce. Line a baking sheet with parchment and preheat oven to 375º. Arrange kebabs on the baking sheet. Drizzle with olive oil and sprinkle with salt, pepper, and red pepper flakes. Bake for 20-25 minutes, rotating every 5-7 minutes until veggies are tender and browning on the edges. This recipe can also be made in the oven. Line a baking sheet with parchment and preheat oven to 375º. Arrange kebabs on the baking sheet.